The Meaning of "Dress Shoes"
The shoe is a basic staple and an essential part of our dress code. No matter what occasion, weather or dress code, shoes are something we all wear every day of our lives. The style of shoe we select is usually determined by the style of clothes and the occasion we are dressing for. The most standard men’s shoe that has become a classic in its own right is the dress shoe. The dress shoe is designed and intended to be worn for smart-casual, business-formal, formal and special events. But as the times and trends change, classic men’s dress shoes have found their way into everyday dress combinations and styles. What defines a dress shoe? No matter the style, all shoes have similar parts: The upper part consisting of a vamp, the front part of the shoe and the quarters that cover the back side of the foot. The bottom part is called the sole and may consist of one or several layers of leather, natural rubber or some artificial material. The first thing that defines a good dress shoe is the material from which it is made. The most common material for making men’s dress shoes is leather, but there are also non-leather men’s dress shoes available. Some of the most expensive shoes even have leather soles. A more sensible choice for durability is soles made from natural or artificial rubber. The classic dress shoe is made from several pieces of leather carefully stitched together that may or may not have some sort of brogue details on them like punched patterns along the stitching. Now, not all leather shoes are considered to be dress shoes, and every modern man should know the difference and get the appropriate pair of shoes for the occasion. There are several types of men’s dress shoes and we will explain them each in reverse order of “dressiness”, from the most formal to the most casual men’s dress shoes. The basic distinguishing feature of men’s shoes is their manner of fastening. We should mention that these are not the only styles of men’s dress shoes but they are the most popular worn by men around the world. The most formal men’s dress shoe is the classic Oxford shoe. This design is characterized by subtle lines and a closed lace-up system. The classic Oxford style dress shoe has a low heel and no details or decorations. The more high-end or bespoke Oxford dress shoes have leather soles. The Oxford dress shoe doesn’t have much decoration and has a simple polished glossy or matte finish. While they come in several colors, the most formal Oxford dress shoes are usually in black highly polished (patent) leather finish with no embellishments. While in most cases, these kinds of shoes are pretty mellow in their design, you can find some that are a little brighter and livelier. In some cases, they can have more of a shine, come in unique colors or feature styles that appear more like alligator skin. Depending on your personal tastes, there can be a large variety of choices out there that should provide something for everyone. Just make sure you have the perfect outfit to match the shoes you select! This type of dress shoe is similar to the Oxford but is considered less formal. While Oxford dress shoes have closed lacing, Derbies have the eyelets on the top of the vamp, giving them an open-lacing system. Standard Derbies usually come in black or brown. When you don’t need to take your formal dressing to the max, Derbies can be a great option. They allow you to look classy while offering some of the comfort you might find in a pair of tennis shoes. They can be an ideal option for events and at work where a full suit isn’t needed. You can also find these shoes in more basic designs, as well as those that feature the addition of a brogue texture. This can allow for a few more options, allowing people with different tastes to find what they need. Another style of shoe, based on the classic Oxford men’s dress shoe, the brogue shoe or wingtip shoe is considered a business-appropriate dress shoe. The brogue shoe is distinguished by the top cap style. While they come in many colors, the most popular ones are black and several shades of brown as they are less formal than the Oxfords or Derbies and are usually worn in a business environment. There is a decent variety to the kinds of wingtip shoes you can find, from those with just a small touch of the brogue design to some with more elaborate decoration. If you’re looking into this style of shoe, then it’s important to keep in mind where you plan on wearing the shoes and what you’ll want to wear them with. It’s a good idea to not go too over the top with the decoration. Another style of men’s dress shoes, monks don’t have laces and are closed by a single or double strap with a buckle. The classic monk dress shoe is considered as business formal attire due to its wider heel and buckle. Today the monk dress shoe is usually worn by more stylishly daring people. As the name dictates, these shoes did begin with olden-day monks who wanted to find an alternative to the traditional sandals. They can often be a great idea for those who are keen on avoiding shoelaces that may need to be retied multiple times throughout the day. You can also find these shoes in the brogue style, much like many other options out there. The classic loafer dress shoe is one of the least formal and most laid-back styles of shoe. These are put on by simply slipping them on the feet, as they do not have laces or buckles. Loafers are considered more business formal rather than fully formal attire. If you don’t want shoelaces and aren’t a fan of the buckled look, these are a great way to go. They offer an easy, great-looking style that you can easily put on or take off. They also come in a pretty decent variety of designs to ensure that everyone gets what they are looking for. If you have an event that doesn’t require the most formal option, this style of shoe can be a fantastic way to go! The classic men’s boot, the Chelsea boot is another very popular design. Chelsea boots come in a variety of colors and with many possible details. However, the classic formal Chelsea dress boot is usually without any decorations or brogue details and is usually in the black leather finish. These are a great option for those who are looking for a little more coverage. They travel further up the ankle, offering a little more stability than other types of shoes. They are sometimes also offered in some more durable designs for those who need a little more foot safety without having to sacrifice a classy look. There are also laced and slip-on options to fit the needs of just about everyone. Men’s dress shoes are usually in colors such as black, dark brown, brown, burgundy, chestnut, cordovan or white. While dress shoes come in many different colors, those mentioned above are the most common and most worn by men across the world. Considering that the dress shoe is usually combined with a suit, dress slacks or a tuxedo, the black or brown shoe are most likely to be chosen for this type of wear. 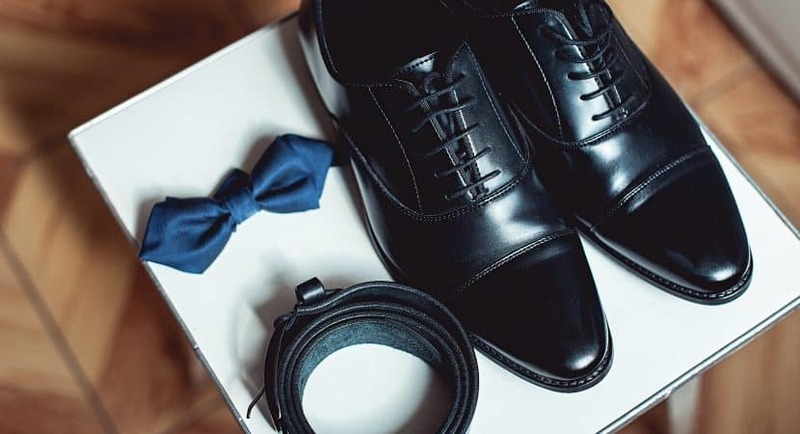 It’s important to be careful while you are shopping for dress shoes to ensure you select a color that will work well with the clothing options you will be most likely to wear. Back in the day, it was very important for a gentleman to be dressed appropriately for every occasion, and it was rare to see someone break the style rules. In the 1800s in Scotland, the classic men’s boot was slowly replaced by low-cut shoes and the Oxfords were born. The classic attire was perfectly paired with shoes and other details, and this gave way to a trend and that trend has continued until today. When selecting formal attire, remember to prioritize simplicity and elegance and choose accordingly. You can certainly wear all the above-mentioned dress shoes around the office, but when faced with a truly formal event like the opera or a wedding, you cannot go wrong with the classic Oxford dress shoe in black patent leather—just borrow the classic style of Frank Sinatra.